Get live and on-demand access to major competitions, Grand Prix Series events and more with NBC Sports Gold. Nathan Chen and Vincent Zhou highlight the top U.S. moments from figure skating’s annual premier competition. Transcendent greatness in sports is both absolute and relative. Nathan Chen was both at the 2019 World Figure Skating Championships. The biennial event takes place this year in Fukuoka, Japan. The last time the U.S. put two men on a World Championship podium was 1996. The U.S. teams in the field, who all train together in Montreal, finished in third, sixth and ninth place. Bradie Tennell and Mariah Bell miss earning a third quota spot for the U.S. at next year's World Championships. The top American couple after the rhythm dance is just 0.01 points from bronze medal territory. After winning their fifth consecutive European title, Papadakis and Cizeron look to be unstoppable at the World Championships. Nathan Chen won the world title in 2018 and is looking to repeat. A top-10 finish meant success for the lone American pair, Ashley Cain and Timothy LeDuc. Nathan Chen will face a stacked field of competitors at the 2019 World Championships. Olympic champion Alina Zagitova could win her first world title. The French pair has plenty of momentum ahead of the World Championships, but other contenders could keep them from taking the title. The World Championships are in Saitama, Japan from March 18-24. “I’ve been in this position before where I came back from injury before the Olympics and that was valuable experience that will help," said the two-time Olympic gold medalist. Skaters from Japan and Russia will battle for the top spots at the World Championships this week. Chen has been juggling a full college course load with competitive skating as he preps for this week’s world championships. Gabriella Papadakis and Guillaume Cizeron are eyeing their fourth world title. New U.S. pair champions Cain and LeDuc know the pressure’s on to qualify more quota spots at the world championships. After sitting out of competition for 10 months and moving to Montreal, Chock and Bates’ abbreviated season might actually help in their quest to return to the ice dance podium at Worlds. Madison Hubbell and Zachary Donohue won silver at last year’s world championships, but are looking for more this year. Bell thinks the success of her fall season will carry through the rest of the season, including the world championships. Yoshiko Kobayashi, the director of the Japanese Skating Federation, explains how Japan has become a major force in figure skating. Ice dancers Kaitlin Hawayek and Jean-Luc Baker will compete at their second world championships next week. In 2016, he was the world junior bronze medalist. Bradie Tennell on her surge in popularity since winning the national title in 2018, and her ability to sell the storylines in her programs this season. Hanna Harrell changed her jumping technique in order to mimic the skaters from Russia. Coaches and skating officials are divided on whether age minimum should be implemented on the national, not just international, level. Vanessa James and Morgan Ciprès were the first French pair to win the European Championships since 1932. The Haydenettes are headed to the World Synchronized Skating Championships 2019 in Helsinki, April 12-14 as the top U.S. team. The senior Skyliners team won the senior short program with 82.58 points, a season's best. The junior free skate at the U.S. Synchronized Skating Championships is Friday. Jason Brown is scheduled to make his third world championships appearance this March. 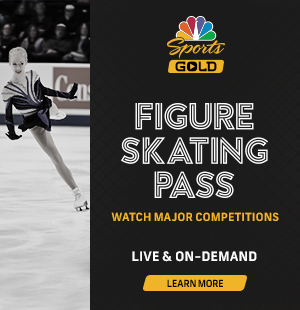 The U.S. Synchronized Skating Championships will stream live on NBC Sports Gold's Figure Skating Pass. Yevgenia Medvedeva is the 2016 and 2017 world champion. Elizaveta Tuktamysheva is the 2015 world champion and Yevgenia Medvedeva won in 2016 and 2017. Michal Brezina tells NBCSports what he learns from training with Nathan Chen. The Russian Cup was widely considered an unofficial skate-off for Russia’s third world championship slot. Gold said winning a medal at the world championships would be more redemptive than going to the 2022 Olympics, though that's another dream. The Olympic Channel: Home of Team USA will broadcast 14 hours of special coverage to honor figure skating at the 1994 Winter Olympics. “We are extremely proud that Ivan’s father was a great champion in his time." U.S. Center for SafeSport said Tuesday there was no reason to continue its probe into allegations sexual misconduct against Coughlin.